LX is available in 7 different colors - Black, Starlight Black, White Pearl, Deep Blue Metallic, Mercury Gray Mica, Sleek Ecru Metallic and Sonic Tiatnium. Lexus LX is an incredibly polished SUV model, which is also known for its unparalleled on-road performance. In UAE, it is currently available in four trim levels namely Premium, Prestige, Platinum and Titanium for the buyers to choose from. In addition to these, both the Titanium and Platinum variants are available with an exclusive Sport package', which adds to its overall stance. All these variants are equipped with an advanced 5.7-litre petrol engine that is capable of producing a commanding power of 362hp along with a hammering torque of 530Nm. However, the most important aspect of this SUV is its spacious internal cabin that is furnished with lavish seats. It can host seating for at least eight passengers by providing ample leg, shoulder and head space. This vehicle is packed with tons of comfort features 8-way power adjustable front seats including AC function, 'Lexus' navigation system and an advanced radar based cruise control system. Furthermore, it is also incorporated with an advanced multi-information screen that displays critical information and keeps the driver informed. This vehicle is also bestowed with innovative safety features including pre-crash protection system, multi-terrain ABS with EBD and an active traction control technology. It has a specially designed body structure with enhanced impact absorption rate that can even disperse the energy of a 5.0 ton impact. In terms of appearance, this vehicle has a masculine body structure featuring classy cosmetics, which gives it a distinctive look. The most attractive of its exterior is its signature chrome radiator grille that emphasizes its exclusivity. This vehicle is placed against the likes of Porsche Cayenne, Land Rover Range Rover and Toyota land Cruiser. This Lexus LX SUV series has an extremely spacious internal cabin that is done up with extensive use of leather. On the other hand, its cabin can be personalized with variety of color schemes to give a compelling look to its interiors. Its cockpit has a well carved dashboard that houses a concave center fascia. It is in a dual tone color scheme, which is further decorated with wood and brushed silver inserts. It also has an ergonomically positioned floor console that houses rotary switches along with gearshift selector and a few storage spaces. The steering wheel has four spokes, which has wood inserts and covered with premium leather upholstery. Both the seats in cockpit are electrically adjustable in eight different ways. All the four door panels are equipped with illuminated power window switches that adds to the convenience. At present, there are four variants available in this model series, which are equipped with important comfort features. Its dashboard houses a multi-zone automatic climate control unit featuring a total of 28-vents, which consistently ensures pleasant climate inside. This SUV also has a multi-functional steering wheel accompanied by paddle shifters, a cool box, LED interior lighting, 8-way adjustable front seats including memory setting for driver's seat, electric tailgate open function, automatic wiper system, moon roof and back door split design. Apart from these, this vehicle also has a cruise control system, multi-information display, optitron meters, power steering, electrically operated windows with one touch up/down function, smart entry including start system and power adjustable outside mirrors featuring smartlink and camera. The automaker has also incorporated features like front and rear corner sensors, which provides excellent assistance to the driver while parking in tight corners. The entry level variant is incorporated with a proficient audio system featuring a radio, DVD player and a total of 9 speakers. While the remaining variants have been bestowed with Mark Levinson audio system featuring a DVD player and 19-speakers, which delivers high definition sound output. In addition to these, the automaker has also incorporate an eight inch EMV touchscreen display that provides touch controls for several multimedia applications and supports navigation. The Lexus LX has a very large body structure that is elegantly decorated with distinctly designed cosmetics. Its front facade is fitted with a radiant headlight cluster that houses dual projector headlamps along with LED daytime running lights and turn indicators. It flanks a chrome plated radiator grille that is designed with four horizontally positioned strips. It is further embedded with the iconic 'L' symbol that emphasizes its elegance. The front body colored bumper has a wide air dam that also has a pair of chrome strips. Its side profile has a compelling body structure with well curved wheel arches. These are fitted with a set of stylish five-twin spoke design alloy wheels that adds to its elegance. The door handles along with the side moldings, waistline molding and the alloy wheels are garnished in chrome that gives it a classy appeal. The rear profile has a very large tailgate that is accompanied by a wide windscreen and a spoiler. The taillight cluster houses LED brake lights, turn indicators along with courtesy lamp, which dazzles the rear profile. The rear bumper looks quite sleek, but is fitted with a pair of reflectors, which provides additional safety. This luxury SUV has a total length of 197 inches along with a width of 77.6 inches. Its total height is measured at 75.6 inches, whereas its wheelbase is measured at 112.2 inches, which is quite long. The entry level variants are equipped with a set of stylish 18-inch alloy wheels, while top end variants are blessed with five-twin spoke design 20-inch rims. These wheels are covered with high performance tubeless radial tyres, which provides excellent grip, especially on off-road conditions. This vehicle is currently available with a 5.7-litre petrol engine that has high pressure fuel injection technology. This vehicle has the ability to give a maximum mileage of just about 6.36 Kmpl. Powering this model series is the 5.7-litre petrol engine that has high fuel injection technology. It comprises 8 cylinders and 32-valves based on dual overhead camshaft valve configuration. This naturally aspirated power plant has the ability to produce a maximum power of 362bhp that results in a hammering torque output of 54 Kg-m, which is quite good. The automaker has paired this motor with a six speed automatic transmission gearbox, which distributes torque output to all four wheels. Its power plant is incorporated with eight cylinders, 32-valves, which are based on a dual overhead camshaft valve configuration. This naturally aspirated engine can produce a power of 362hp in combination with a mammoth torque of 530Nm. The automaker has paired its motor to a six speed automatic transmission gearbox, which transmits torque output to all its four wheels. This enables the vehicle to achieve a top speed of 220 Kmph and can break the 100 Kmph speed barrier in mare 7.8 seconds. All the four wheels are fitted with a set of high performance disc brakes, which provides excellent stopping power. This mechanism is enhanced by multi-terrain ABS with EBD and brake assist system. Its front axle is fitted with double wishbone suspension system and the rear axle is paired to a four-link coil spring system, which is incorporated with 'Adaptive Variable Suspension' technology. The car maker is offering all the variants in this Lexus LX series with sophisticated safety features like eight airbags, active traction control system, multi-terrain anti lock braking system, electronic brake force distribution and vehicle stability control. In addition to these, it also has brake assist system, side monitor system, rear view camera, pre-crash safety system, and intelligent adaptive front lighting system. 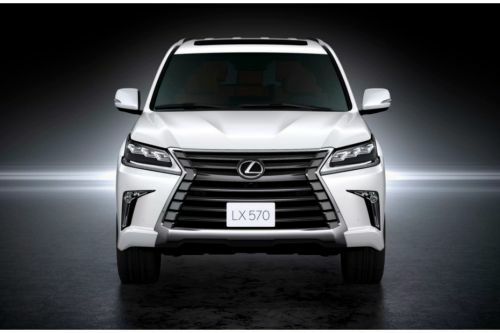 What is the price of Lexus LX? On road prices of Lexus LX in starts from AED405,000 for base variant 570 Premier, while the top spec variant 570 Platinum Signature costs at AED500,000 .